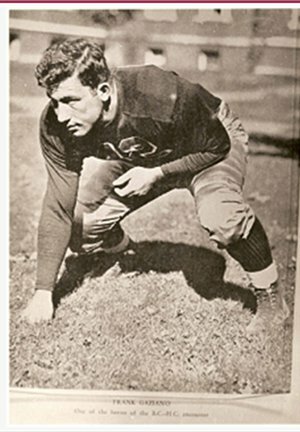 A new scholarship and awards program for Maine high school football players has been created in memory of Frank J. Gaziano, founder of National Distributors and a former college All American and professional football player with a life-long passion for local sports. Jeffrey Kane, President of National Distributors and Frank Gaziano's son-in-law, said, "These lineman awards are a fitting tribute to Frank. He loved football and felt that the basic principles of football helped shape his business and personal life. Frank always felt linemen were the unsung heros of a football team. Successful football plays don't happen without linemen doing their jobs." The Annual Frank J. Gaziano Memorial Offensive and Defensive Lineman Awards will be presented to players who epitomize the character, leadership, and perseverance of Gaziano. Recipients will be selected by an awards committee based on their strong leadership on the field, in the classroom, and in the community. Jill Gaziano Mitchell added, "My father believed practicing the basics and being prepared were the building blocks for success whether it was on the football field, in the classroom or later in your professional life. Dad served as a role model for how people can achieve success in their lives." Through the new program, one offensive player and one defensive player will each be awarded a first place trophy and a scholarship of $2,500. Each recipient's name will also be engraved on permanent plaques that will rotate each year among high schools with winning players. In addition, two runners up will be recognized in each category, with each of the four selected players receiving a commemorative plaque. All six players will be given a special Frank J. Gaziano Memorial Offensive and Defensive Lineman Awards leather jacket. Peter DeSimon, a New England key account manager with PepsiCo., spearheaded the creation of the awards program with the Gaziano family. DeSimon said, "I worked for National Distributors for more than 20 years, and Frank was my mentor. As former football players, we shared a love of the sport. To me, Frank was a true American, building a company and achieving success through hard work and determination. This is my thank you to Frank and the Gaziano family." Applicants are nominated by their coaches. Coaches may nominate any number of players, and nominations from all levels of Maine's high school football three-class system are eligible. This year's deadline for submitting applications is 3:30 p.m., Friday, December 10, 2010. For nomination forms and additional information, visit www.gazianolinemanawards.org or contact the Frank J. Gaziano Lineman Awards Board of Directors at (207) 773-1719, ext 3303. Matt Perkins, 2010 Maine High School Coach of the Year and head coach of the Windham High School Football team, helped organize the scholarship and awards program. He said, "As a former Maine high school lineman, I am very excited about this award. It's a great way to recognize some of the other outstanding players on the field and not just as players but as people." To qualify for consideration, applicants must be a high school senior, have competed at the varsity level for a minimum of two years, and have an exemplary record of positive athletic and non-athletic citizenship. The submission of a student essay and a game film featuring the applicant competing against his toughest competitor are part of the application process. All finalists will be invited to appear before the awards committee for a personal interview. Recipients will be announced at an awards banquet held at the Augusta Civic Center Sunday, January 23, 2011. Every nominated player will receive three free tickets to attend the banquet. Gerry Raymond and Raibonne Charles will be featured speakers. In 1978, Raymond became the only lineman to ever win a Fitzpatrick Trophy, awarded annually to Maine's top high school football player, while at Lewiston High School. He went on to become an All American player for Boston College, and an All Pro for the United States Football League. Currently, Raymond is an umpire on a five-man crew officiating 5A Texas High School Football, the highest level of football in the state. Charles is a former Windham High football player and a starting defensive lineman with the University of Maine Black Bears. Funding for the $2,500 scholarships is being provided by National Distributors. The awards committee will also be securing sponsorships and selling corporate tables at the awards banquet to increase the sponsorship level this year and in subsequent years. If you are interested in contributing to the scholarship fund, please call (207) 773-1719, ext 3303. Gaziano, of Cape Elizabeth, was a well-known benefactor and businessman in the Portland area. He graduated from the College of the Holy Cross in 1941 and went on to a professional football career with the Washington Redskins and the Boston Yanks (which later became the Indianapolis Colts). After serving in the U.S. Army during World War II, he joined Anheuser-Busch as a route salesman and quickly climbed the executive ladder. In 1960, Gaziano resigned from Anheuser-Busch and purchased National Distributors, Inc. Today the company employs 200 people, operates out of a 150,000 square-foot warehouse and has separate sales forces selling beer, wine and non-alcoholic beverages. This year, it is celebrating its 50th year in business. Gaziano passed away at the age of 92 on January 16, 2010. During his lifetime, he gave back to his community in many ways including a $50,000 donation to support the construction of the Deering Oaks Bandstand; providing funds to the Portland Police Department to purchase a mobile, high-tech Intoxilyzer; and the establishment of several student scholarships. He also donated rings for the 1996 South Portland Football State Championship Team. Gaziano is remembered by many in the community for his weekly sports trivia columns titled "I Bet You Didn't Know." He authored those columns for over 25 years. For more information, visit Gaziano's profile at www.nat-dist.com. The Frank J. Gaziano Lineman Awards Board of Directors includes Peter DeSimon; Matt Perkins; Pete Cloutier; Jill Gaziano Mitchell; Jeff Kane of National Distributors; Judy Gaziano Kane; Mike Haley; Charles Hews; Mike Marston of Mid-Maine Homeless Shelters; and Michael Quinlan of Jensen, Baird, Gardner and Henry.